First Name, Last Name, and Email are now required field for support accounts and all empty required fills have been filled with placeholder data. New Domain and URL for Faculty180.com (This is primarily a marketing page, no changes for folio180.com. Prior to the release:When an administrator is setting up a support account, they were able to set the password from the 'login details' section when adding a support account. Following the release:To ensure password security and efficacy, we have updated the system to send an e-mail to the support account's email for the support account user can set their own password. Additionally, administrators can choose to send a new email or a password reset email through the 'Send User' field and the relevant links. 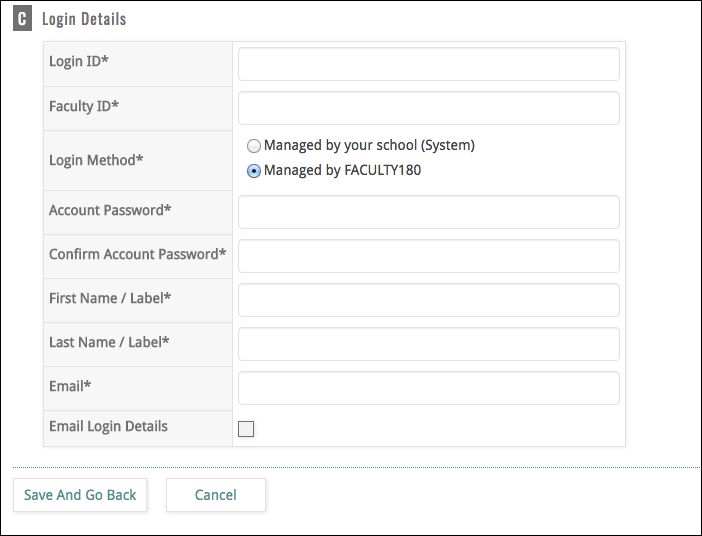 The Change: If an user has registered the same email with Interfolio and with Faculty180, then the user will be able to log in and access Faculty180 from their Interfolio account, after logging into their account through account.interfolio.com. This will affect all users that have an existing Interfolio account in Faculty Dossier / Faculty Search / Promotion & Tenure. 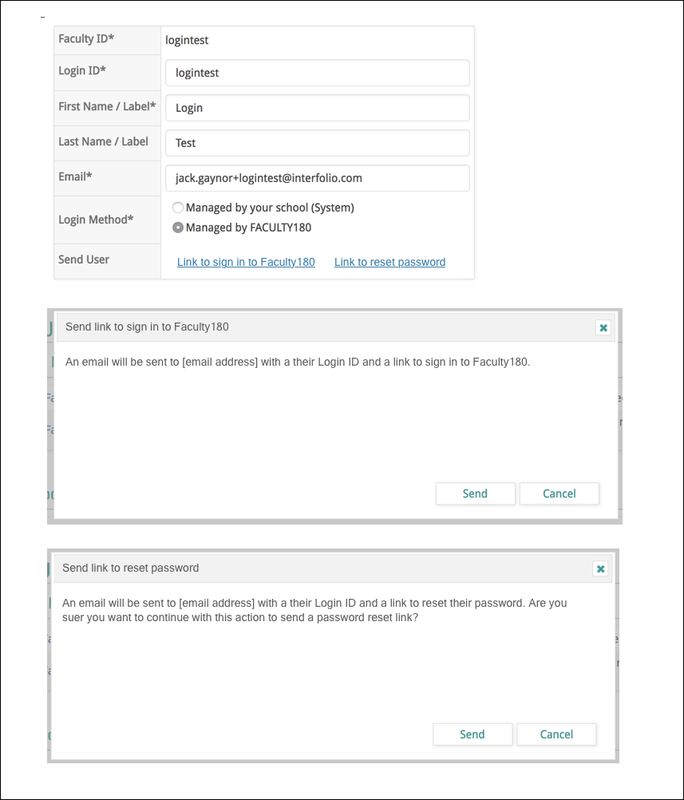 If the faculty member uses the same email address in both their Faculty180 and Interfolio accounts, the faculty member will have the option to login to Faculty180 via the normal campus portal or through their Interfolio account. For example: John Smith has a personal Interfolio Dossier account registered with his work email: jsmith@school.edu. John Smiths institution uses Faculty180 and registers it to his work email (jsmith@school.edu). If John Smith logs in at account.interfolio.com, he will see a link to Faculty180. Will this change any URLs or links? No. All saved URLs and links will continue to work after the update. 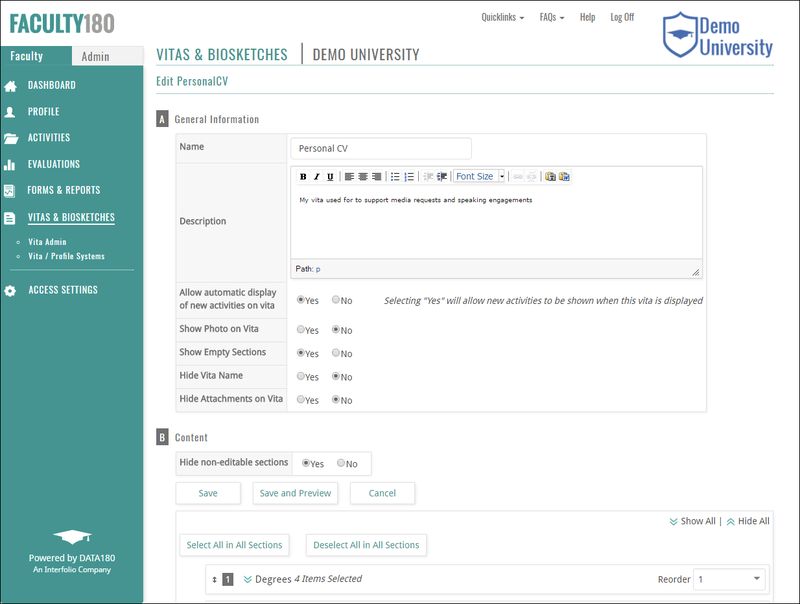 Will ANYONE be required to access Faculty180 or their Interfolio account in a new way? No. All URLs, links, bookmarks and similar methods will continue to work in the same way when logging into Interfolio or Faculty180. What will this look like after logging into Interfolio (at account.interfolio.com)? What will this look like after logging into Faculty180? This will have no effects on the appearance of Faculty180. At this time, users will not be able to access Interfolio directly through Faculty180. Is the institutions Faculty180 SSO/Authentication being applied? Yes, if your institution requires SSO authentication, then it will be checked before giving access to Facutly180 from Interfolio. Can I change the email associated with my Interfolio account? Please submit any and all questions to a new Freshdesk ticketthis will ensure that your questions get answered.